Perpignan overturned a half-time deficit to beat big-spending Toulon in the Heineken Cup in an enthralling quarter-final in Barcelona. 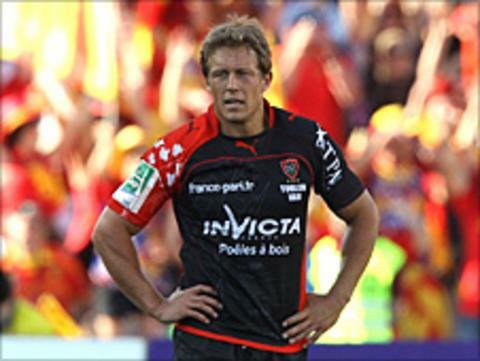 Jonny Wilkinson kicked 10 points for Toulon but could not inspire his team against the 2003 runners-up. Instead it was compatriot Perry Freshwater who was the hero, scored the winning try in the 81st minute. Perpignan held on despite a late Fabian Cibray try and will face either Northampton or Ulster in the last four. The defeat will be a bitter blow to ambitious Toulon owner Mourad Boudjellal's aspirations of lifting Europe'an club rugby's premier trophy. Although his side outscored their arch-rivals three tries to two, the kicking accuracy of full-back Jerome Porical, who slotted 19 points, proved to be the difference between the two teams at Barcelona's Olympic Stadium in front of a sell-out 55,000 fans. Toulon had excellent opportunities to extend their 11-6 first-half lead when Perpignan were twice reduced to 14 men when second rows Guillaume Vilaceca and Robins Tchale-Watchou were yellow carded. A George Smith try on the cusp of half-time gave Toulon the advantage, but the Catalans hit back through the boot of Porical and a try for winger Adrien Plante following a line-out drive. Toulon hit back almost immediately through captain Joe van Niekerk but two further Porical penalties and former England prop Freshwater's match-winning score allowed Perpignan held on for the win.